GM Ryan Pace loves to preach the constant saying of “we’ll draft the best player available.” That’s certainly the buzz phrase fans have adopted over the past three years. Why? It sounds logical. Forget position or needs. Just find the most talented guy on the board and take him. End of story. This should be the Chicago Bears draft philosophy forever more. Except it’s never that simple. High draft picks are always dictated by need. Always. 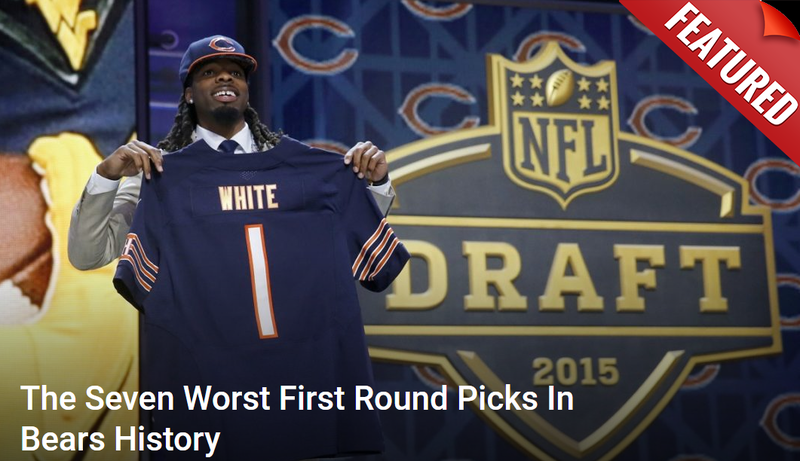 Did the Bears need a wide receiver when they took Kevin White in 2015? Yes. Yes, they did. They’d just traded Bradon Marshall and had no proven option outside of Alshon Jeffery at the time. That pick wasn’t a surprise to anybody. So rearranging things under those parameters, how does the board shift? People talk about Quenton Nelson, Denzel Ward, Tremaine Edmunds, Roquan Smith and Minkah Fitzpatrick all the time. If this happens, the Bears will take him. If that happens, the Bears will take him. So on and so forth. That was looking at things under the BPA model. So how about the best player-for-biggest need option? In that context, the entire focus narrows at one position: edge rusher. Not one of those names has produced 10 sacks in a season in their careers. Floyd is coming off a major knee injury. Lynch hasn’t had more than two sacks in a year since 2015. Acho is in his 30s. Jones is a journeyman signed for emergency depth last season. Irving is a former undrafted free agent. How does that lineup not terrify people? This defense badly needs help and free agency is largely picked clean. That leaves the draft. Bradley Chubb, widely considered the best in 2018, is not expected to make it out of the top five. That leaves one viable name for the Bears to consider: Harold Landry of Boston College. Few players were probably more frustrated in 2017 than Landry. He had to play through most of it on a bad ankle, which hampered his ability to get after the quarterback. He’d proven the year before what he can do when having too good wheels, racking up 16.5 sacks and seven forced fumbles. This wasn’t against cupcakes either. He had three sacks in a game against Virginia Tech and two against Florida State. He also had a memorable sack against Deshaun Watson and Clemson. Landry can play. The general feeling is too many people are getting hung up on his biggest issue. Landry is an average run defender. His mix of limited size (6’3″, 250 lbs) and strength make him a weak point in that area. That indeed would be a problem……if this were 1973. The NFL is a passing league. Teams win games on third down and third down is won by getting the quarterback. Landry is gifted at that. It seems the media might not be recognizing this. Last few days of talking to people and hearing Minkah Fitzpatrick is going too early in these media mock drafts, and Harold Landry is going too late. Landry is absolutely the player they want. He’s got the body and athleticism made for outside linebacker in a 3-4 defense. The tape is there. The production is there and the strong combine is there. Will he be the best player available at #8 overall? Maybe not. He’ll definitely be the best player who fills the biggest need.